Traditionally, periodontal hand instruments are honed or sharpened during patient care as they dull easily during contact with enamel, calculus and cementum. This approach is taught in dental and hygiene schools around the world and remains the standard of care. Recently, some professional organizations have questioned whether this practice should be abandoned because of safety issues. Questions have been raised whether sharpening stones can be properly sterilized and whether the sharpening of contaminated instruments poses a health hazard for the provider. Using bacteria culture techniques and scanning electron microscopy, we tested whether contaminated ceramic sharpening stones can be sterilized. Our results demonstrate that the stones were sterile after being subjected to the manufacturer’s sterilization protocol. In addition, over the last year, no incidents related to periodontal instrument sharpening have been reported among nearly 400 students at the faculty of dentistry, University of British Columbia, where chair-side sharpening is taught. Therefore, we conclude that ceramic sharpening stones can be sterilized using normal office protocols and that chair-side sharpening adds little risk beyond routine handling of operatory or periodontal instruments during patient care when proper protocols are followed. Difficult cases and some types of procedures may require an instrument to be sharpened several times during a single treatment session using a sterile stone. Several authors have recommended that periodontal instruments be frequently sharpened or honed using sharpening stones during a debridement session to maintain the cutting edges in proper working condition.8,9 The maintenance of a sharp cutting edge during treatment provides numerous benefits, including increased tactile sensitivity for the operator, increased patient comfort and increased control of the instrument. Thus, reduced instrument slippage (i.e., an instrument sliding in a direction the operator did not intend and potentially causing damage) leads to improved safety for both the patient and operator.7,10,11 The ability to sharpen instruments at chair side ensures that these benefits will be realized. The use of sharpening stones during patient care has been questioned by some professional organizations because of possible hazards of occupational exposure and lack of evidence that sharpening stones can be properly sterilized. Although no evidence in the literature supports these concerns, protocols have been prepared and enhanced by the same organizations.12 Exposures to risk during patient care in dentistry are relatively common.13-17 Needles and burs are the most common instruments associated with risk, while periodontal instruments are involved in about 10% of incidents.16 Incidents often relate to patient movement or improper handling or cleaning of instruments.14,18 We did not find any data that specifically deal with percutaneous injuries during instrument sharpening chair side nor any evidence that contaminated sharpening stones are not properly sterilized using the standard sterilization protocols recommended by the manufacturers. We hypothesized that using the manufacturer’s protocol, sharpening stones can be sterilized. Furthermore, we approached the clinic director at the University of British Columbia (UBC) to find out the prevalence of incident reports among novice users of periodontal instruments. Ceramic sharpening stones (medium grit; Hu-Friedy, Chicago, Ill. USA) were used for the study. Fifteen new stones were cleaned and sterilized according to the manufacturer’s protocol. Briefly, the stones were cleaned in a thermodisinfector and then placed in a EZ 10 dental sterilizer (Tuttnauer, Hauppauge, N.Y., USA) for 7 minutes at 134°C and 31 psi with a drying time of 31 minutes. The stones were then divided into 3 groups of 5 stones. One group of stones (control) was sterilized as above but never used in patient care. A second group was used to sharpen dental curettes during a routine maintenance appointment in a periodontal office. Swabs were taken from the portion of the stone used for sharpening multiple instruments throughout the appointment. The remaining set of 5 stones was used as above but then cleaned and sterilized as described above. Swabs were taken from these instruments immediately after completion of the sterilization cycle. Stones were wiped with swabs designed for collection and transportation of bacterial specimens (BD BBL CultureSwab; Becton, Dickinson and Co., Franklin Lakes, N.J., USA). Bacterial cultures were prepared as described previously.19 Briefly, the swabs were raised in 1 mL brain heart infusion culture medium (Sigma-Aldrich, Oakville, Ont.) and vortexed for a minimum of 1 minute to suspend the bacteria in the medium. The samples were diluted as necessary and seeded on 5% sheep’s blood agar plates (VWR International, Randor, Penn., USA). One agar plate per sample was incubated at 37°C for 3 days under aerobic conditions. A second plate was placed in an anaerobic pouch system (AnaeroGen; Oxoid, Basingstoke, UK) and incubated at 37°C for 7 days. Petri dishes were removed from the incubator after 3 or 7 days, and digital images (Rebel T1i; Canon, Tokyo, Japan) were taken for the purpose of counting bacterial colonies using the image processing software ImageJ 1.46r (National Institutes of Health, Rockville, Md., USA). Bacterial growth was recorded as either no growth (−) or growth (+). The Fisher exact test was then used to determine the efficiency of the sterilization protocol. A set of sharpening stones treated as above was fixed in 2.5% glutaraldehyde (Electron Microscopy Sciences, Hatfield, PA, USA) in 0.1 M PIPES [piperazine-1,4-bis (2-ethanesulfonic acid)] buffer for 5 minutes and processed for scanning electron microscopy (SEM). A set of curettes used for periodontal maintenance debridement and then wiped with cotton gauze was also processed for SEM as above, to observe the presence of retained metal filings on the sharpened curette. New unused ceramic sharpening stones that were sterilized did not show any bacterial growth on either aerobic or anaerobic plating conditions (Table 1, Fig. 1). All new stones that were used once for chair-side sharpening during routine periodontal debridement showed bacterial growth both in aerobic and anaerobic culture conditions (Table 1, Fig. 1). As expected, the contamination level in terms of colony-forming units (CFUs) varied among the stones: 9–1600 CFUs per swab in aerobic and 24–2800 CFUs per swab in anaerobic conditions. When the used instruments were processed and sterilized using the recommended office protocol, all ceramic sharpening stones tested were found to be bacteria free (Table 1, Fig. 1). The efficiency of sterilization was then tested with Fisher’s exact test and found to be highly significant. Table 1: Presence (+) or absence (−) of bacteria cultured from ceramic sharpening stones before and after their use for chair-side sharpening. 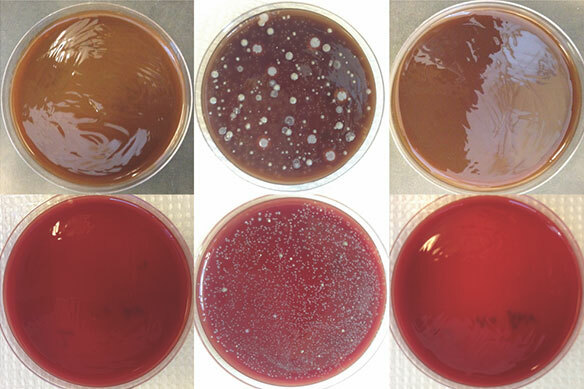 Figure 1: Representative blood agar plates of aerobic and anaerobic bacterial cultures from a new unused stone (left), a stone after it was used for chair-side sharpening (middle) and a stone that was used chair side and then cleaned and sterilized (right). Figure 2: Scanning electron microscopy images showing (A) an unused sterilized ceramic sharpening stone, (B) a stone used for chair-side sharpening and (C) a stone that was used for chair-side sharpening and then cleaned and sterilized using normal office protocol. Debris is visible together with worn lattices of ceramic crystals in B (arrows). Debris is no longer present after sterilization; however, worn lattices remain on the stone surface (C, arrows). We then analyzed a set of ceramic stones that were new, used or used and sterilized. Under SEM, the unused and sterilized stones showed lattices of ceramic crystals (Fig. 2A). The stone that was used for sharpening at chair side showed worn crystal lattices and debris with particle size consistent with broken lattice particles, bacteria or metal filings (Fig. 2B). When a used stone was cleaned and sterilized, the debris was no longer present but the worn lattices were still retained on the surface as expected (Fig. 2C). We also used SEM to examine the curettes that were used to reveal how much debris was present on the blade after instrumentation followed by sharpening and wiping with gauze. The used instrument had debris on the cutting edge and on the face of the blade (Fig. 3A). After sharpening and wiping, the instrument contained minimal debris and metal filing particles (Fig. 3B). Figure 3: Representative scanning electron microscopy images of (A) a used curette showing debris on the cutting edge and face after sharpening (arrows); and (B) a curette showing minimal debris (arrows) after it was sharpened chair side and wiped with cotton gauze. To determine the prevalence of occupational exposure during sharpening of periodontal instruments, we contacted the clinic director of the UBC dental clinics. No incident reports dealing with instrument sharpening, either in simulation or patient care, had been filed over the last year. These clinics include nearly 400 dental, hygiene and specialty students who can be considered novice users of dental instruments. The results of this quality-control study show that ceramic sharpening stones can be successfully sterilized using the recommended routine protocols. In addition, instruments that were sharpened and wiped with gauze during a chair-side session contained minimal metal debris. These observations support the worldwide standards in periodontal instrumentation recommending sharpening/honing instruments during patient care.8,9 These standards have always emphasized the importance of chair-side maintenance of the cutting edge of periodontal instruments. Therefore, the organizations that have policies preventing chair-side sharpening/honing by their members should re-consider their regulations. For example, in 2011, the College of Registered Dental Hygienists of Alberta published a new protocol to be incorporated into dental hygiene practices.20 These guidelines, which preclude chair-side sharpening, were updated again in 2016 and given more authority by a statement made by the executive environment officer of Alberta Health Services and the protocol was adopted at the University of Alberta Dental School.12,21 These protocols are enforced for hygienists in Alberta, putting them at risk of disciplinary action should they use the previously accepted standard of care of chair-side sharpening. Given the lack of references, research or incidents of clinical problems with chair-side sharpening, we recommend that traditional sterilization protocols as listed by the sharpening stone manufacturers be used and that chair-side sharpening be continued in clinical practice as well as taught in Canadian dental schools. Another potential hazard associated with chair-side sharpening might relate to the introduction of metal filings into the patient’s tissues. No data in the literature indicate the presence of metal particles in patient biopsies after treatment. Nevertheless, the sharpening standards should always include the common practice of wiping the sharpened/honed blade with gauze. A set of instrument tips was tested in this study and found to contain little debris after wiping with gauze, suggesting that the risk of particle transfer into patient tissues is relatively low if proper techniques are followed. We conclude that ceramic sharpening stones can be sterilized using normal office protocols and, when proper protocols are followed, chair-side sharpening adds little risk beyond handling operatory or periodontal instruments during patient care. Filings from chair-side sharpened instruments do not appear to be retained when the instruments are wiped with gauze before being re-used in a patient. Dr. Wiebe is a part-time clinical assistant professor, division of periodontics, University of British Columbia, Vancouver, and in private periodontal practice in South Calgary Periodontal Group, Calgary, Alberta. Ms. Hoath is a hygienist in private periodontal practice in South Calgary Periodontal Group, Calgary, Alberta. Dr. Owen is a research associate at the laboratory of periodontal biology, department of oral biological and medical sciences, division of periodontics, faculty of dentistry, University of British Columbia, Vancouver, British Columbia. Dr. Giannelis is an assistant professor and director of the graduate program, division of periodontics and dental hygiene, University of British Columbia, Vancouver, British Columbia. Dr. Larjava is a professor and head of the department of oral biological and medical sciences, as well as chair, division of periodontics and dental hygiene, University of British Columbia, Vancouver, British Columbia. 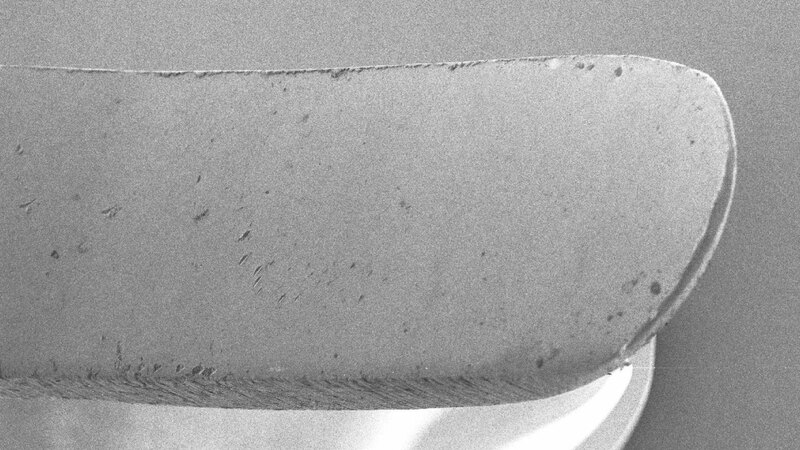 Di Fiore A, Mazzoleni S, Fantin F, Favero L, De Francesco M, Stellini E. Evaluation of three different manual techniques of sharpening curettes through a scanning electron microscope: a randomized controlled experimental study. Int J Dent Hyg. 2015;13(2):145-50. Tal H, Panno JM, Vaidyanathan TK. Scanning electron microscope evaluation of wear of dental curettes during standardized root planing. J Periodontol. 1985;56(9):532-6. Tal H, Kozlovsky A, Green E, Gabbay M. Scanning electron microscope evaluation of wear of stainless steel and high carbon steel curettes. J Periodontol. 1989;60(6):320-4. Scaramucci MK. Instrument sharpening. In: Daniel SJ, Harfst SA, Wilder RS. Mosby’s dental hygiene concepts, cases and competencies. 2nd ed. St Louis, Mo. : Mosby Elsevier; 2008. p. 188-201. Wilkins EM, Boyd LD. Instrument care and sharpening. In: Wilkins E, ed. Clinical practice of the dental hygienist. 12th ed. Philadelphia: Wolters Kluwer; 2017. p. 686-8. Scaramucci MK. Hone your sharpening technique. Dimensions Dent Hyg. 2014;12(2):30-3. Rylander H, Lindhe J. Cause-related periodontal therapy. In: Linde J, Karring T, Lang NP, eds. Clinical periodontology and implant dentistry. Copenhagen: Munksgaard; 2000. p. 451-2. Scaramucci MK. A primer on instrument sharpening. Incorporating sharpening into your daily routine. Dimensions Dent Hyg. 2009;7(9):32-5. Sumi JY, Nguyen M. Hand activated instrumentation. In: Darby M, Walsh M, eds. Dental hygiene: theory and practice. 4th ed. St Louis, Mo. : Elsevier Saunders; 2015. p. 479. Scaramucci MK. Sharpening 101. Dimensions Dent Hyg. 2007;5(5):18-20. Palmer DM. Prevention of disease transmission in oral health care. In: Darby M. Mosby’s comprehensive review of dental hygiene. 7th ed. St Louis, Mo. : Elsevier Mosby; 2012. p. 377-8. Shimoji S, Ishihama K, Yamada H, Okayama M, Yasuda K, Shibutani T, et al. Occupational safety among dental health-care workers. Adv Med Educ Pract. 2010;1:41-7. Cleveland JL, Gooch BF, Lockwood SA. Occupational blood exposures in dentistry: a decade in review. Infect Control Hosp Epidemiol. 1997;18(10):717-21. Younai FS, Murphy DC, Kotelchuck D. Occupational exposures to blood in a dental teaching environment: results of a ten-year surveillance study. J Dent Educ. 2001;65(5):436-48. Leggat PA, Smith DR. Prevalence of percutaneous exposure incidents amongst dentists in Queensland. Aust Dent J. 2006;51(2):158-61. Shah SM, Merchant AT, Dosman JA. Percutaneous injuries among dental professionals in Washington state. BMC Public Health. 2006;6:269. Ghannad F, Alkadi LT, Wiebe CB, Shen Y, Haapasalo M, Larjava HS. Intra-operative application of chlorhexidine gel reduces bacterial counts in internal implant cavity. Eur J Oral Sci. 2015;123(6):425-31. Hughes A, Davies L, Hale R, Gallagher J. Adverse incidents resulting in exposure to body fluids at a UK dental teaching hospital over a 6-year period. Infect Drug Resist. 2012;5:155-61. doi: 10.2147/IDR.S30814. Epub 2012 Oct 25. Porto AN, Borges ÁH, Semenoff-Segundo A, Raslan SA, Pedro FL, Jorge AO, et al. Effect of repeated sterilization cycles on the physical properties of scaling instruments: a scanning electron microscopy study. J Int Oral Health. 2015;7(5):1-4.